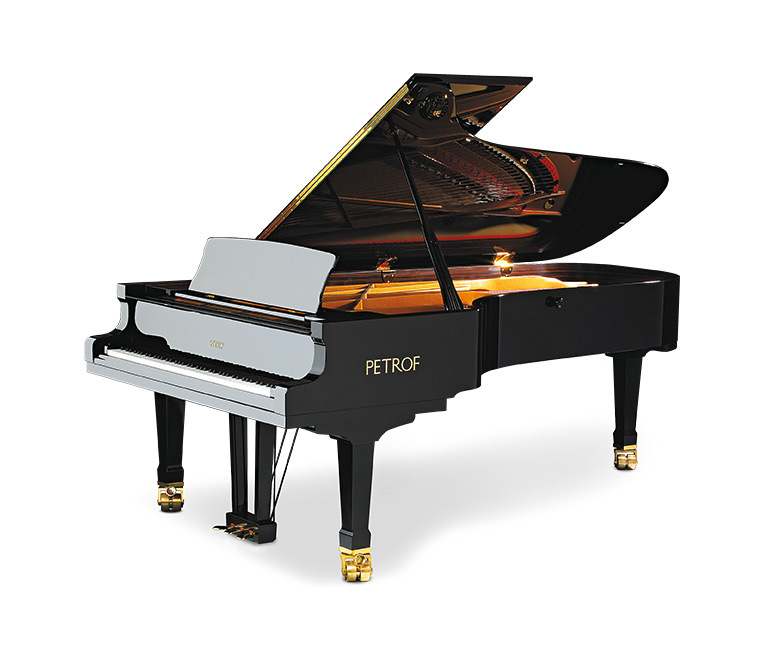 PETROF Grand pianos | PETROF, spol. s r.o. 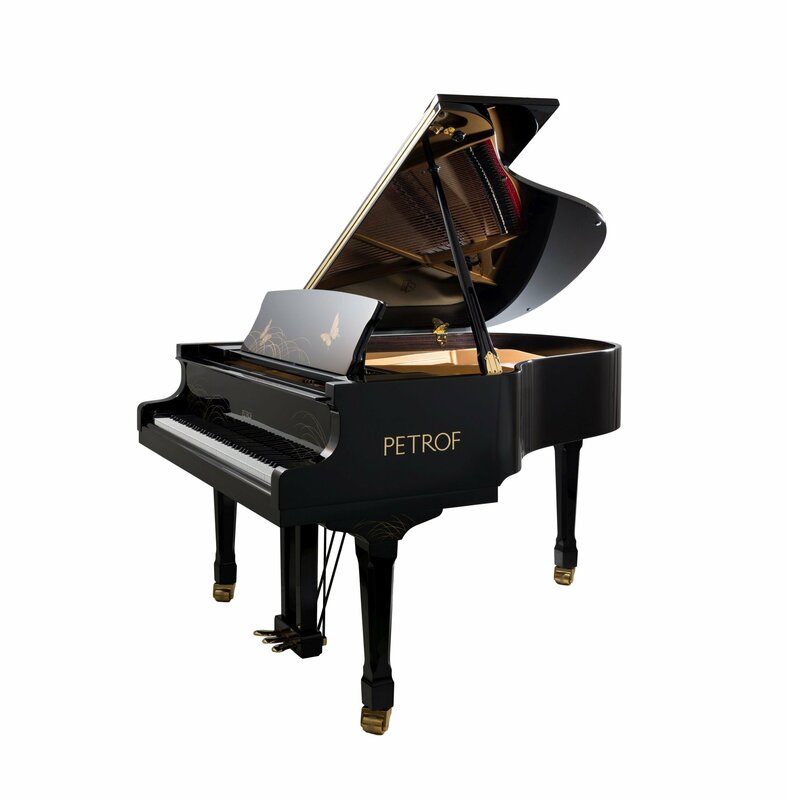 PETROF’s acoustic instruments stir the hearts of music lovers with their typically romantic, rounded and gentle tone. The company’s reputation has spread all over the world and we are proud to be able to continue the family tradition of piano building begun in 1864 by Antonín Petrof, the company founder. 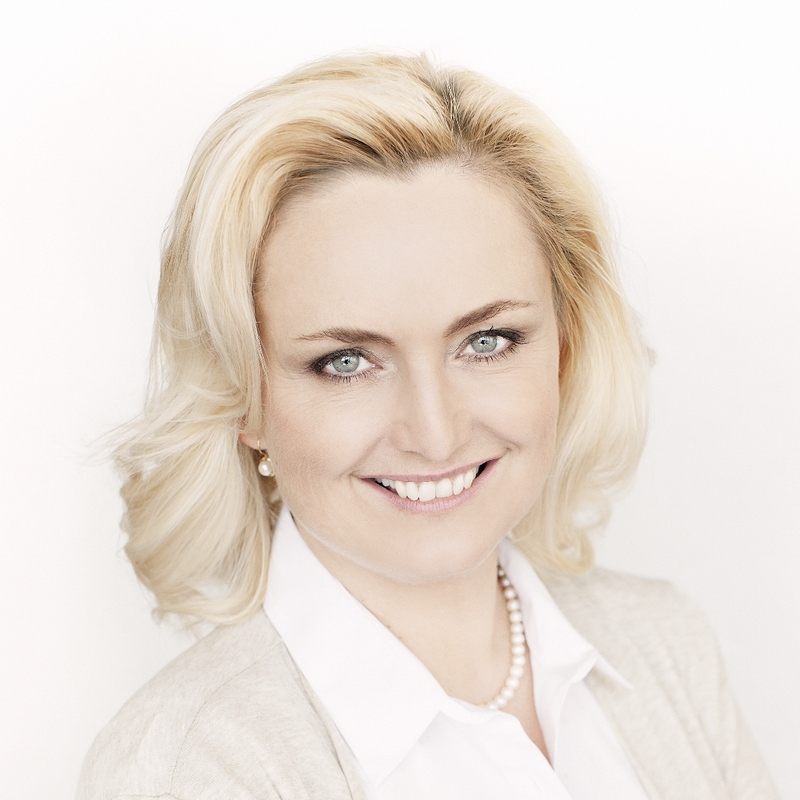 Our portfolio is very wide and has gained an array of patents including the declaration of quality construction materials and their European origin - the European Excellence Seal (EEX). 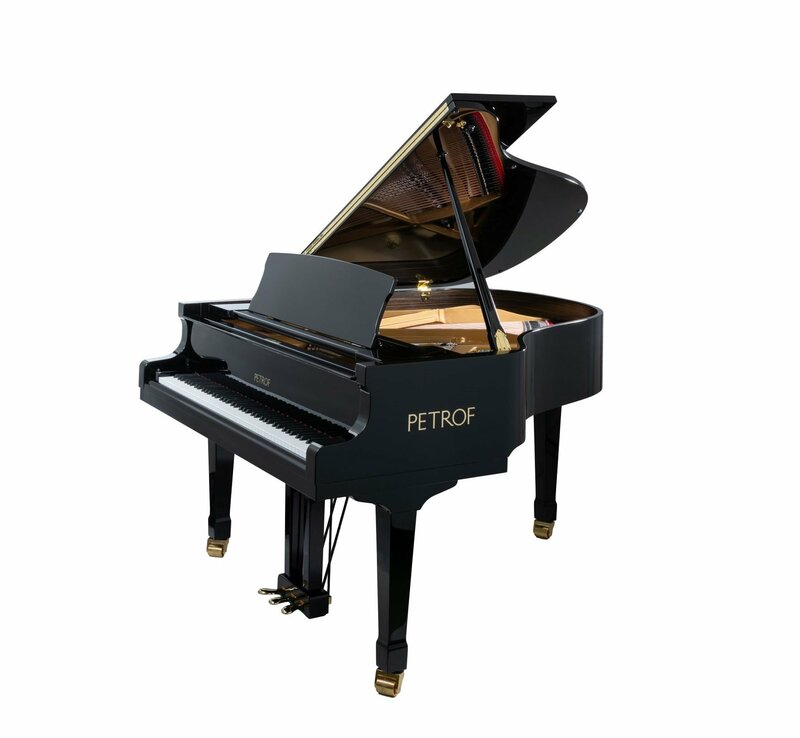 PETROF grand pianos represent the experience of renowned master pianomakers, whose manual work makes up 80% of the manufacturing process. Their hands create instruments of world-class quality as well unique models in a diversity of artistic styles, in exact accordance with our customers’ wishes. We produce beautiful pianos with a characteristic romantic tone for the delight of every player who sits down to play them. The instruments in this series display the meticulous manual work of our highly experienced master pianomakers. 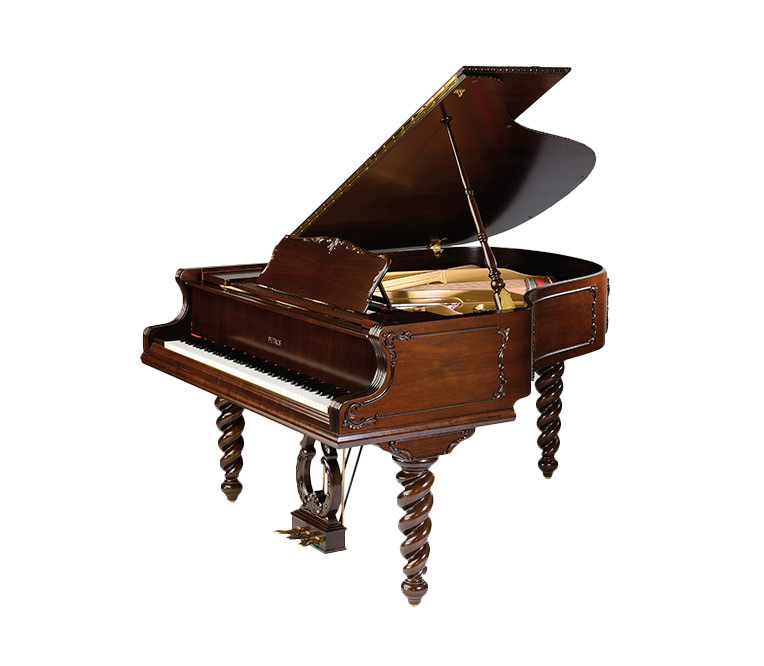 An instrument of this sort normally takes 9-12 months to build and bears the names of the skilled pianomakers, the intoners and the tuners as well as the good name of the entire Petrof family. Pianos of the Master series are intended for use by professionals and in concert halls, where their romantic, soft and unusually rich tone tone will resound to best advantage. 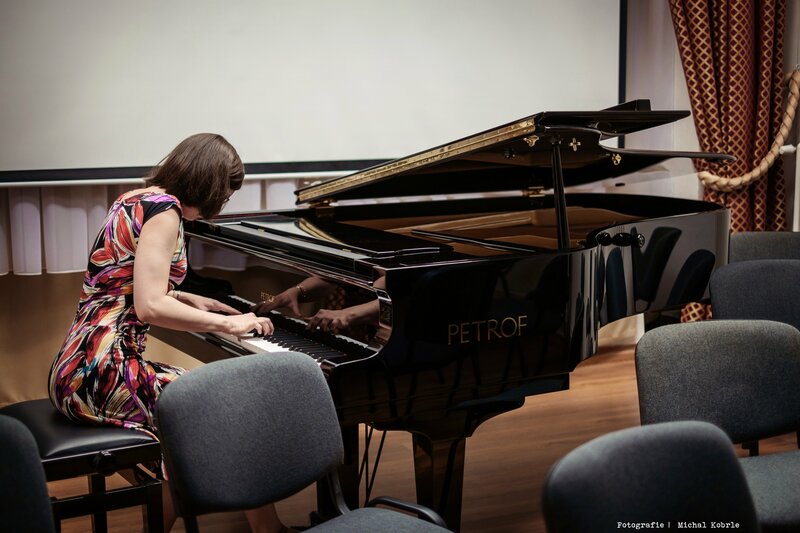 Dozens of experienced pianists, with their knowledge and close scrutiny, have contributed to the development of every instrument, and helped us to achieve even greater perfection. The Monsoon grand boasts a refined, balanced sound, which is best suited to large music halls and recording studios. It has a characteristic romantic tone, and allows musicians complete scope for the expression of their feelings with its faultless action and speed of response. This is an instrument built by the best and most experienced masters of their craft. It represents the optimal balance between size and performance and makes for an impressive addition to a prestigious hotel or any other formal space. 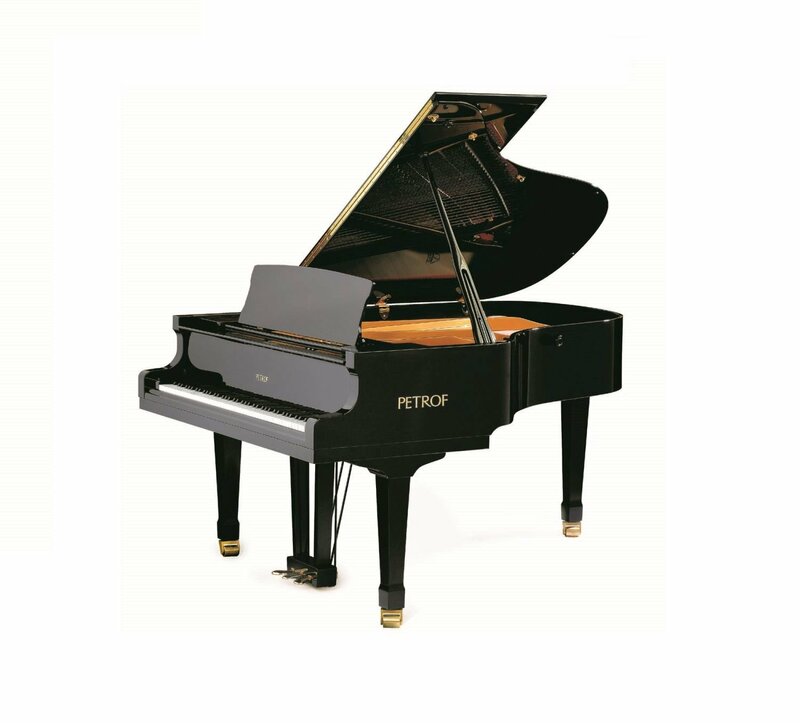 PETROF’s best-selling grand piano and the darling of musical exhibitions - this is the masterly P210 Pasat grand. Its dimensions allow its sound to stand out even in the smallest spaces: chamber music salons, studios and in the home. Anywhere you choose it will conjure up the atmosphere of the most famous concert halls. The list of its successes fills us with parental pride. We shall feel honoured if you too fall in love with its romantic, clear and singing tone. We have a completely individual approach towards the building of our Standard Series models, which enables us to devote the greatest care to each one. This produces instruments that despite their size arouse in both pianist and listener alike the emotions and atmosphere of a large concert hall. The pianos in this series are produced in three lengths and a colourful variety of finishes. 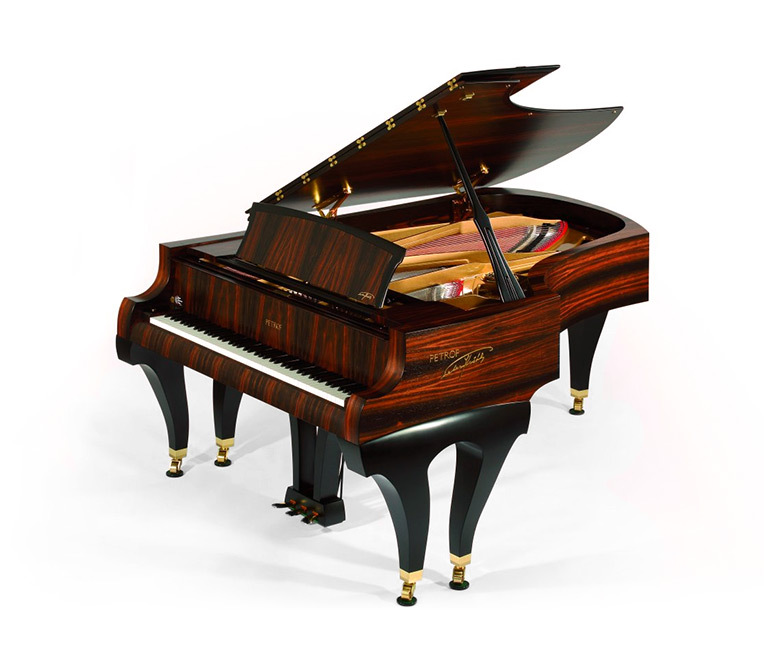 These instruments are distinguished not only by their sound properties, but also by the fact that one can select a piano that perfectly suits the interior or hall for which it is intended. 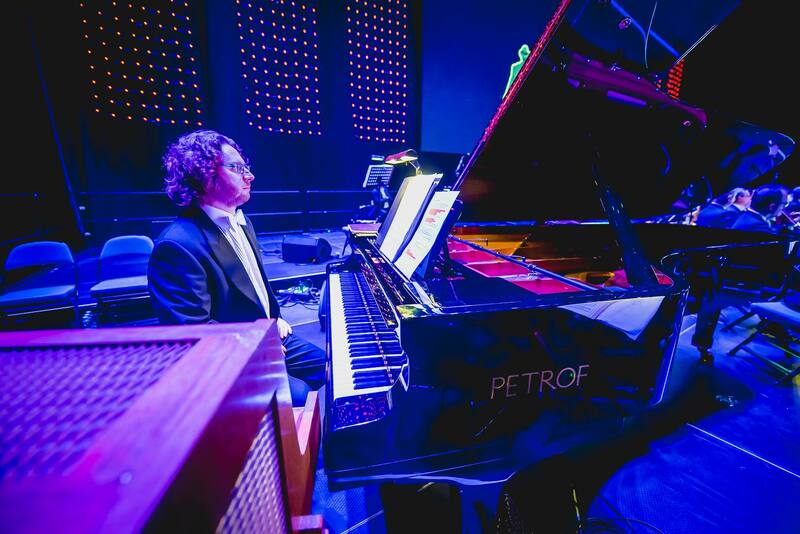 Argentine pianist Antonio Formaro about the P 159 Bora grand piano. For building the grand pianos in our Style Collection we have taken inspiration from the artistic styles of the Rococo and Classical periods. Their beauty lies in the originality of every instrument we build, and the precision of their construction, which embodies the consummate skills of our craftsmen. The Style collection enjoys great popularity among our customers, and they have become an integral part of our production. 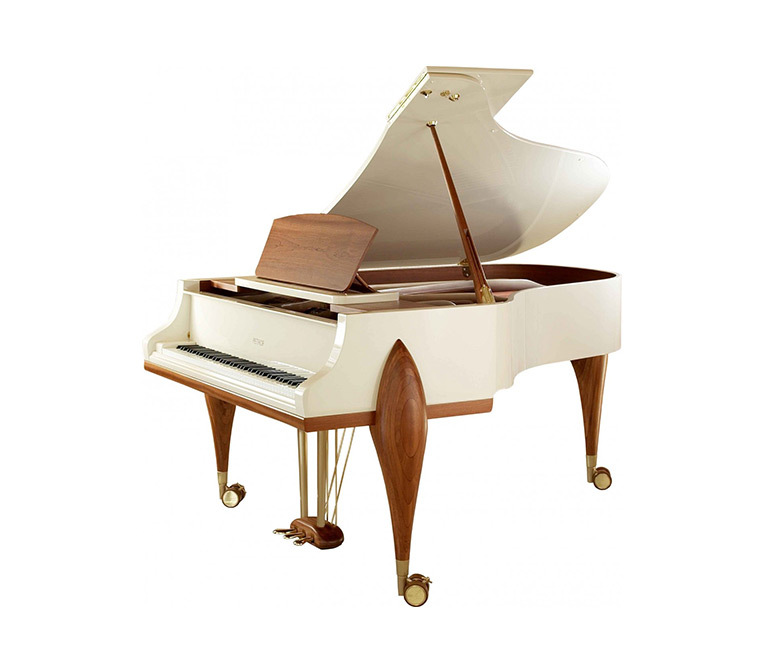 The Breeze Rococo boasts the romantic, unmistakable tone so characteristic of all PETROF grands. It is distinguished from the other instruments by its appearance. We build it in the Rococo style - finished in white and decorated with patinaed elements, ensuring the Breeze Rococo a place in home interiors of similar style. It can also stand out as a special feature in modern interiors. 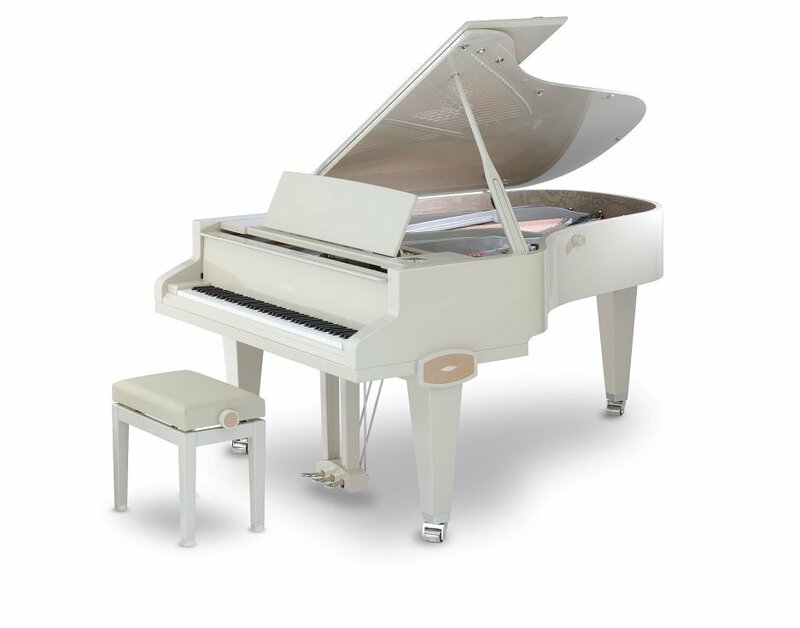 Another member of PETROF’s Style Collection is the Breeze Demichippendale - a grand piano whose artistic design appeals to all the senses. The heart is moved by Its rich and romantic tone, while the eye is gratified by its elegant lines. The Breeze Demichippendale fits best in interiors of the same style, which will be enhanced by its white, black, walnut or mahogany finish. We can, however, make it in any finish. The design of this instrument derives from the Breeze model in the Standard Series. It is, however, a smaller piano concealing within itself a splendid, rich, and surprisingly powerful tone. In designing the Breeze Klasic we took inspiration from the Classical period. The influence of this style is most noticeable in the legs and the decorated music stand, where you can see the masterly work of our carver. 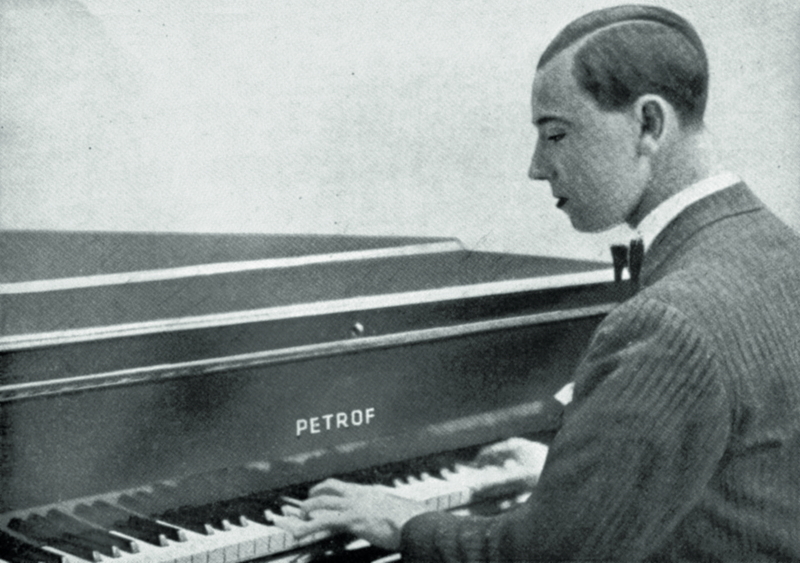 Rudolf Firkušný on PETROF instruments. 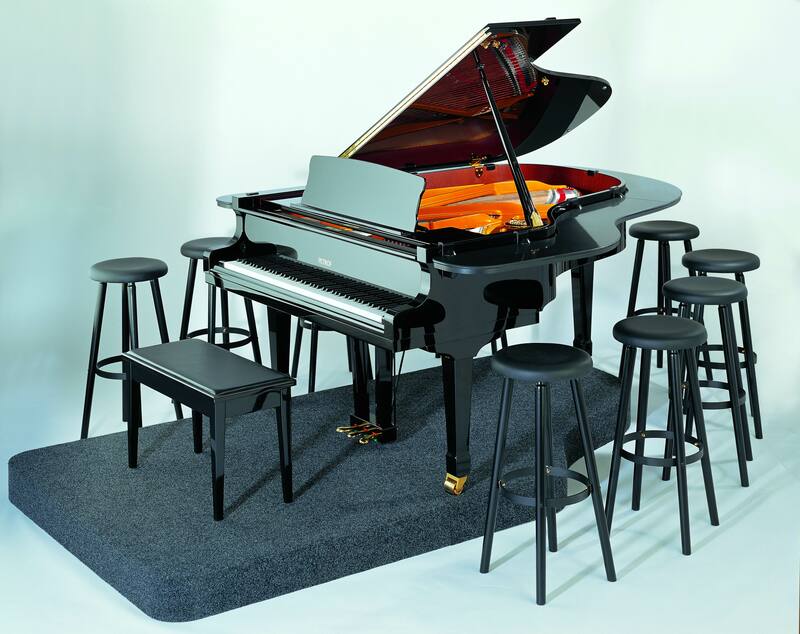 Apart from the grand pianos in the Master Series, the Standard Series and the Style collection, our workshops also build quite unique pianos for special occasions and to meet customers’ requirements. We thereby create custom built pianos with a style and an exceptional sound that hit just the right note with our clients. The artistic musical instrument P194 Sabina is our smallest concert grand and has an unusual and original design: we have adorned it with exotic pearls from the New Zealand Paua. These can be seen mainly on the external edges of the legs, the lyre and the PEROF inscription on the piano lid. Its original design, however, in no way detracts from its outstanding sound quality. It possesses a refined, lyrical tone so popular among musicians the world over. 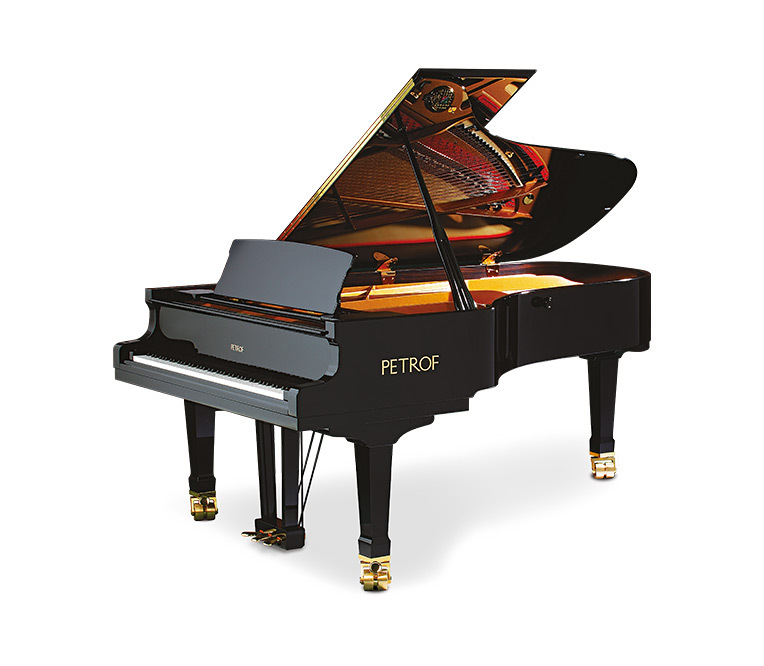 It has become a tradition for PETROF to mark every tenth anniversary with the production of an original grand piano. 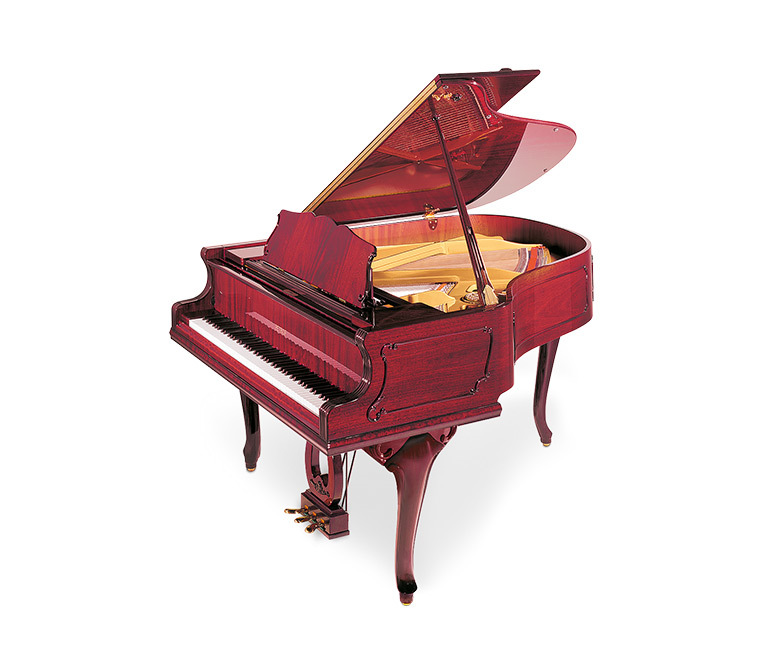 For the 140th anniversary of PETROF’s founding we built the PETROF III, Jubilee Model Opus no. 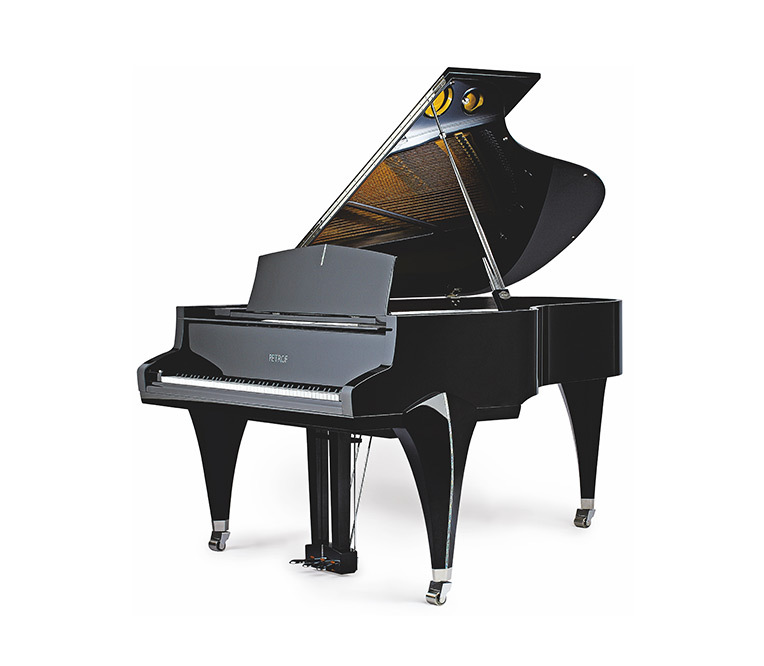 595000, an exceptional and unique grand piano. We equipped it with a magnetically accelerated action, which improved its dynamic qualities while reducing the weight of the individual components. This top-class musical instrument is distinguished by its original and extremely high quality design work. When the idea of producing a fully functional concrete piano was born, it was clear to everyone that it was a big challenge. The main parts are made of a specially developed concrete mixture by Gravelli which is reinforced with tiny glass fibers. Steel has been chosen as the most suitable material for the base, matching concrete perfectly. It is a modern material concept of a classical piano, which is designed especially for the admirers of minimalism and contemporary architecture. 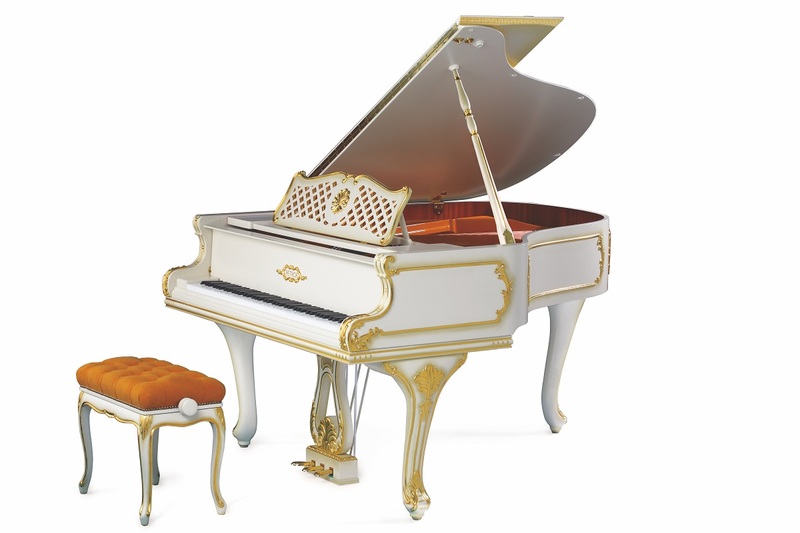 The Stingray grand piano is made especially for the occasion of the 155th anniversary of the PETROF company. Its dominant design motif is the decoration of its specially shaped legs with inlaid pieces of coloured leather from the stingray. Stingray skin will paralyze your senses. It is an incredibly hard and durable material, but fine at the same time. Its appearance resembles small beads that were embedded next to each other by nature itself. The diamond on the ray’s back is unique, just like the fingerprints of the master who is responsible for building of this instrument. Let’s open the lid to discover the beauty! Atelier Mitani, in cooperation with PETROF, has created a unique instrument that combines Japanese craftmanship and music, precision and piano construction from the Czech Republic. 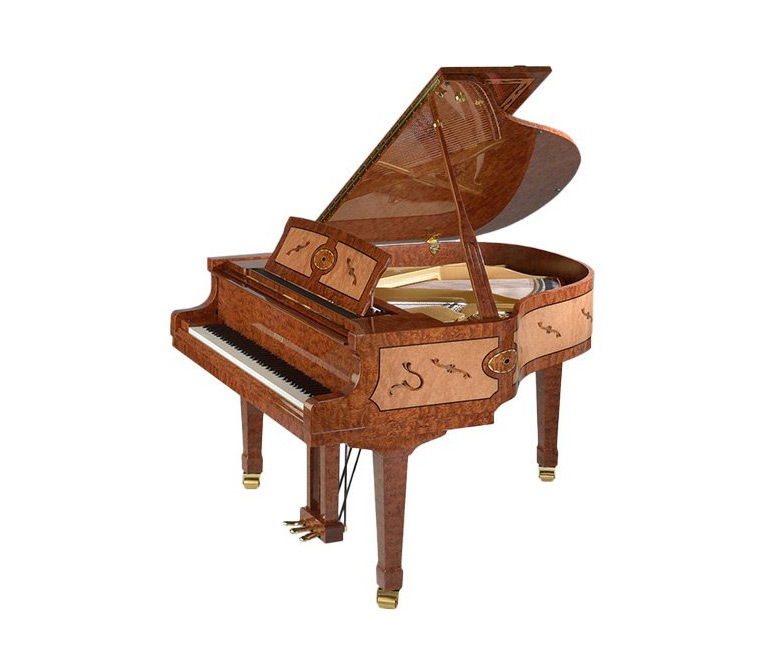 With the use of the traditional Japanese technique of maki-e, the piano is decorated with butterfly motives. One of these is the national butterfly of Japan called Japanese Emperor. When changing the incident light, butterflies look alive. The grass is represented by a cut of golden slices, along with the inserted mother-of-pearl pieces. 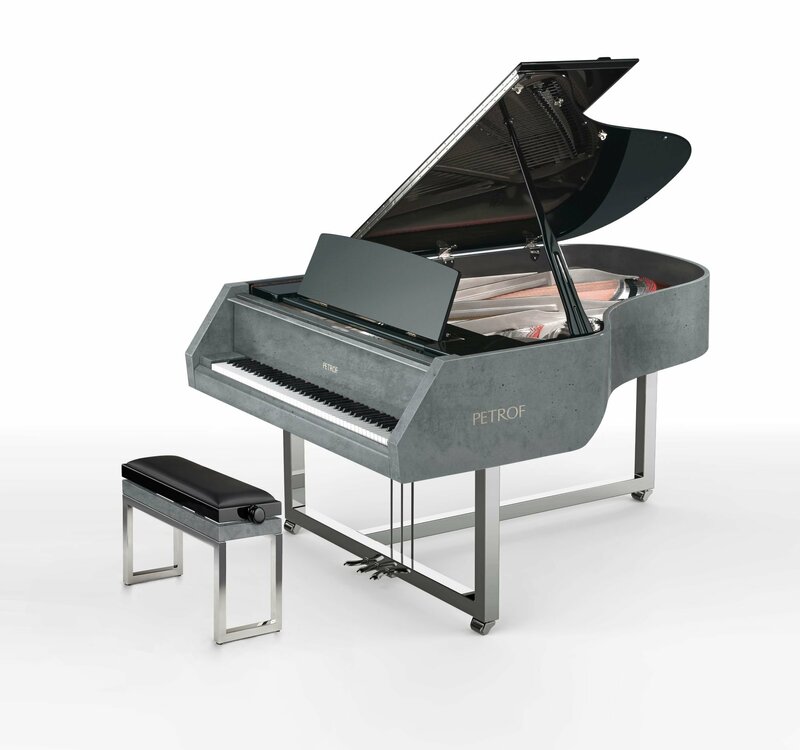 The P210 grand piano as designed by the Slovak director Peter Kršák is an example of customised art production fulfilling the personal wishes of a very demanding customer. The client stipulated both the internal and external design, and our master craftsmen drew inspiration for its construction and its sound parameters from the P210 Pasat. 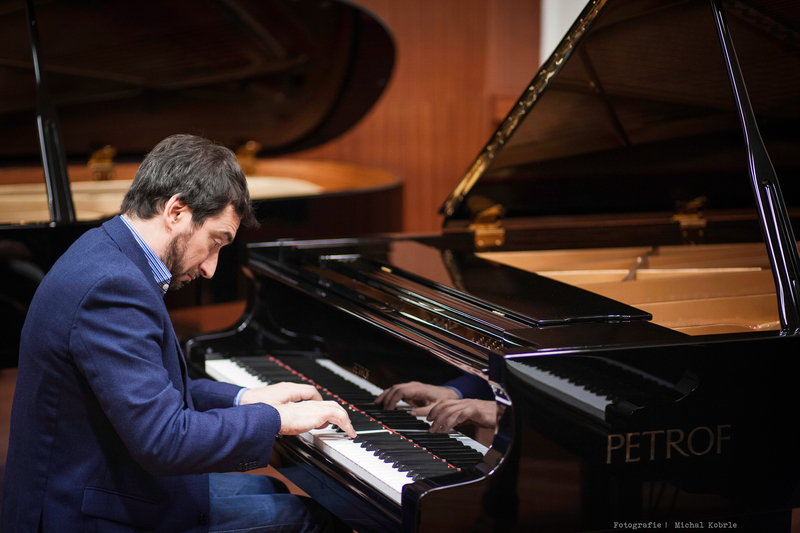 The result is a high-class and original piano which was no sooner installed in Mr. Kršák’s Bratislava residence than several well-known Slovak pianists took pleasure in playing it. The Baroko grand presents a characteristic supplement to a baroque-style interior. Every professional performer is charmed by its captivating appearance, but most of all by its gentle and rounded tone. 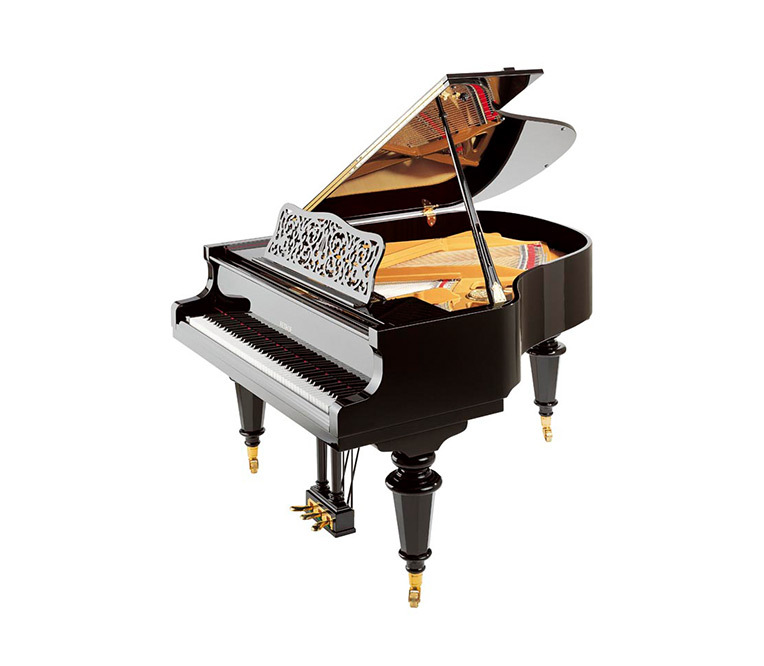 This unique, specially designed instrument is tuned to perfection, exactly as pianists and their listeners would expect. 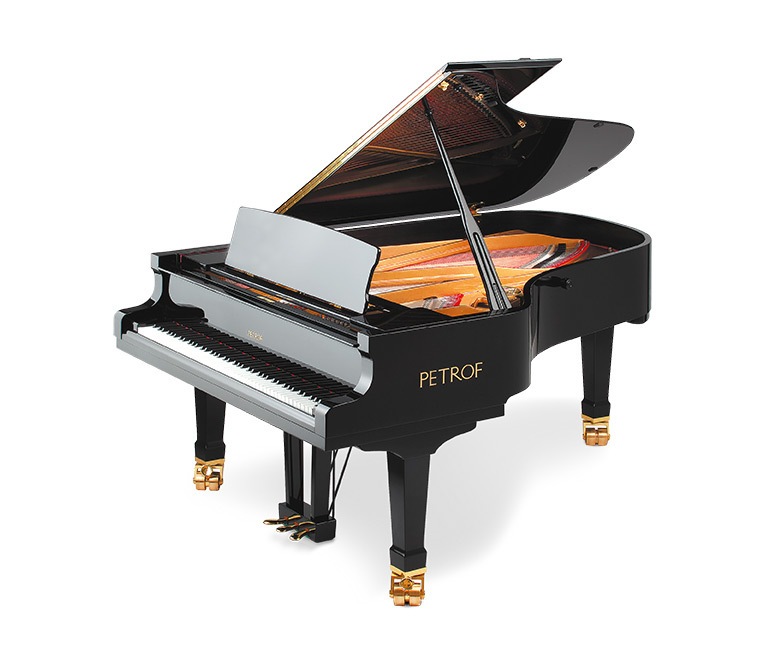 The Rokoko Gold also possesses the characteristic rounded and romantic tone of PETROF instruments. What makes it unique, however, is its use of Baroque design, ivory colour and gilded decorative features, making the Rokoko Gold ideal for Baroque-style interiors. 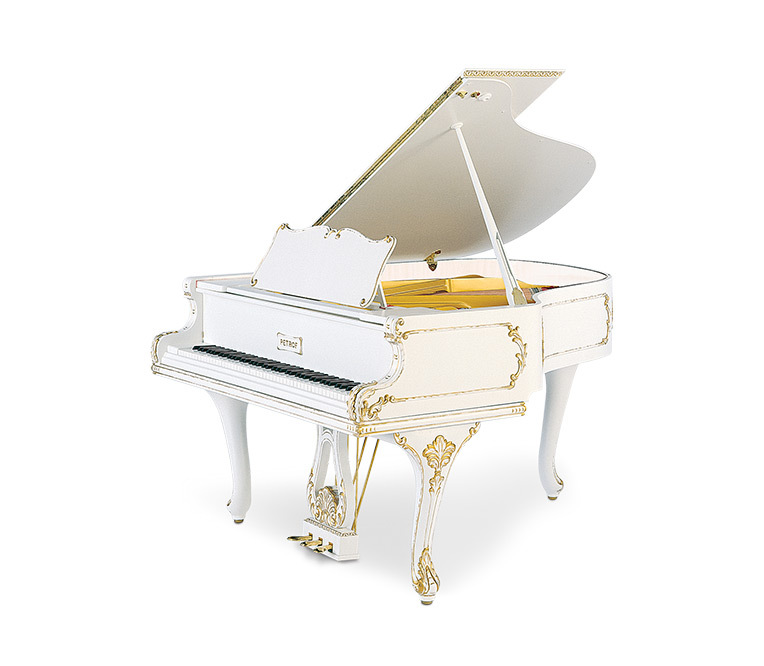 We used gold plate for the decoration of the piano. While developing and building new prototypes we created a piano with a bar-style seating arangement. It is perfect for music clubs, where it adds to the pleasant atmosphere. As with our other pianos the Pianobar has a characteristic tonal colouring. We have supplemented the piano with the PianoDisc, providing us with a unique set. Following the requests of a customer we set about developing this prototype. While building it we discovered that we could apply the technique of marquetry to a very high standard. The technique of marquetry is the acme of the joiner’s art, which we now possess, enabling us to produce almost any design by using various veneers and colourings.